I adapted this easy recipe from Cake Student because I had everything on hand and it worked out beautifully. I used a little more water than the recipe called for, and I did add slightly more brown sugar and spices. By slightly more, I mean rounded teaspoons instead of being specific with my measurements. I mean can a few extra pinches of brown sugar really hurt? Peel, Core, and Chop a dozen apples. I used apples from our trip to the Apple Orchard. I’m no apple expert, but these apples were more dense than the apples I typically buy in the grocery store. The flavor was great, but it took longer to break down in the Crockpot. 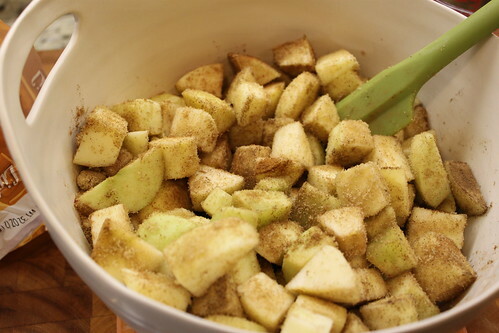 Toss the apples in the sugar and spices. Put everything in the Crockpot, then [say it with me] Set It, and Forget It! anyone else remember that infomercial? After a few more hours on low, I bumped it to high and propped the lid. it cooked down and thickened quite a bit. I suppose it’s optional, but I decided to blend the butter down smooth. You can eat it right out of the Crockpot, I did. I just took a spoon to the Crockpot and dove in, it was divine. However, for the finished product I wanted it smoother and pulled out my Magic Bullet since I don’t own an immersion blender. Then poured it into clean canning jars. So after 15 hours and a dozen apples picked right from the tree, I had 1 pint of delicious apple butter. I froze half the batch and have the other half in the fridge just waiting to be eaten…maybe straight from the jar. Does this recipie only make 2 pint’s of apple butter? Is there room enough in the crockpot to dbl. the recipie? Thank you. well this gets a FIVE STAR YUM rating!!!!! this is on my to do list this weekend FOR SURE thanks for sharing this recipe!!!! 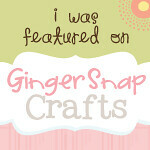 i feel so silly but i can’t find the spot to follow the blog! i will try later : ) thank you so much! see you later! This looks amazing! I just pinned this. I can’t wait to get my hands on some farm fresh apples & try this! Thanks for linking up! thanks so much for linking up such great fall inspiration. Have a happy & creative week ahead. It really has to do with how long you cook it down. 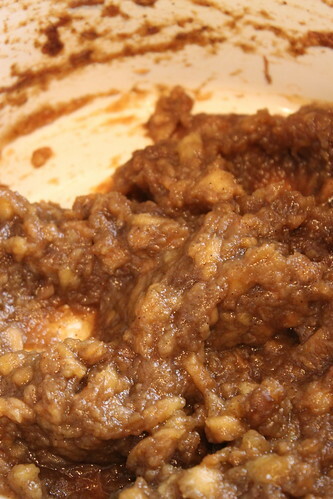 There is definitely a stage where it is exactly like very sweetened applesauce, but if you keep cooking it down, it will continue to thicken and the sugars will caramelize. It is kinda like apple sauce but smoother and the spices make it really good on biscuits. Just made this last night and it’s very tasty! But I’m wondering how your apple butter is so light. Mine is really dark. Any ideas? When you blend something (especially in a Magic Bullet) it whips air into and that’s why it’s lighter. Regarding the 15 hours, how many (ish) hours on high and how many (ish) on low? Can’t wait to try this! Thanks! it depends on the brown sugar you are using if you are using dark it will be darker and also the different apples you use can make a difference. You say to add sugar and spices but what kind of sugar and spices and how much? Thanks! How long does this stay good in the fridge? The apple butter has never lasted long enough in my house for it to go bad, but my last jar lasted several weeks in the fridge with no problem at all. I did a little research and it seems that 1 month seems to be the consensus and if you add a little citric acid to the mix it will likely last longer. I usually split the batch among several jars and freeze whatever I want to save. I only keep a small amount in the fridge at any one time. Hope this helps. Do you know how long this will keep in fridge before going bad? My last jar lasted several weeks in the fridge with no problem at all before we finished it. I did a little research and it seems that 1 month seems to be the consensus and if you add a little citric acid to the mix it will likely last longer. I only keep a small amount in the fridge at any one time so it never seems to last long enough to go bad (the rest I freeze). Hope this helps. What do you use it for? Eat it with a spoon? spread on toast? thanks!! I have actually eaten it with a spoon straight from the jar, but I wouldn’t normally serve it up that way 🙂 Usually I mix a spoonful into oatmeal or Greek yogurt. Many people spread it on muffins/rolls/toast in place of butter or jam. I’ve also used it as a sweetener in smoothies; although, I wouldn’t count on it adding much of an apple flavor to the smoothie, just some sweetness. Am I the only idiot that can’t find the ingredients you added to the apples? I see brown sugar and spices, and I’m afraid to guess…mine might taste more like garlic butter. Can you help? Thanks! I had included a link to the original recipe in the post; but a lot of people have missed it. To make it easier, I’ve added the recipe to this post. Sorry for the confusion! 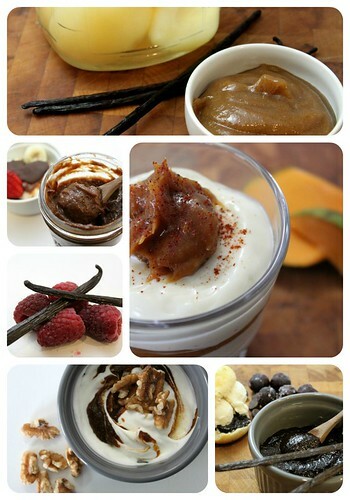 My favorite way to eat it is swirled into oatmeal or greek yogurt. However, many use it on toast/bread/muffins in place of butter or jam. I’ve heard others like making a sandwich with PB and Apple Butter instead of jelly. I’ve also used it as a sweetener in smoothies. I think as a general rule it’s a great alternative for jam/jelly. We eat it with cooked sweet potatoes instead of dumping butter and brown sugar on them! y.u.m. and probably a little better for you. We use the chunky state on our potatoes. We love this kind of stuff on pancakes in place of syrup. Yum! I would love to make this yummy looking recipe. But I don’t have a crock pot. They are not sold here in Norway. Could I procede another way? Yes, you can cook apple butter either on the stovetop, or in the oven at low heat. I haven’t tried either method myself, but I know others that have used the oven method with success. I found the link below, it provides information for the stovetop and oven method. Good Luck! i cant wait 2 try this! Wow! Sounds sooo good! I will definitely have to try this sometime. How long is it good for in the fridge and is it okay to freeze in canning jars? The apple butter has never lasted long enough in my house for it to go bad, but my last jar made it several weeks in the fridge with no problems at all. I did a little research online and 1 month seems to be the consensus and if you add a little citric acid to the mix it will likely last longer. I usually split the batch among several jars and freeze whatever I want to save. So yes, you can freeze in canning jars. I only keep a small amount in the fridge at any one time. Hope this helps. I can mine and then lasts indefinitely…..hot water bath for 20 minutes. Can u explain the hot water bath. I have never canned and thought about starting with this recipe. Thanks! Ball has a great website that provides a easy getting started guide to canning that you can download. I don’t have access to an apple orchard. If I used store bought apples, what type would you suggest and would you alter cooking times? This looks heavenly!! I would stay away from strongly flavored apples like Pippin, instead go with something like Gala or Fuji. The basic red delicious would work great as well. In the end you’re going to have the intense apple flavor, but you won’t really be able to identify the type of apple, so I also wouldn’t waste money on the usually more expensive Honey Crisp either. Go with whatever cheap, fresh apples you can get at the grocery store. It’s likely that the actual cooking time won’t change much, just be sure to check on it a few times in the last few hours just in case. Good Luck! A combination of tart and sweet is great. I also like a little ground cloves. Don’t worry about the cooking times. All night in the crock pot and cook it down to the consistency you like. If you don’t care if it is so smooth, I don’t even peal the apples. I just finished my apple butter but I felt it was a bit runny. I’m a first timer, so I’d like to ask, what should the consistency be? The finished product shouldn’t bee too watery, the consistency should be something like a very soft creamy peanut butter. Some apples are ‘juicier’ than others so it’s not uncommon for some batches to be a bit runny. Some things you can try to get rid of the water: (1) Cook at high heat and prop the lid earlier in the cooking process so that the water can escape and cook off (2) Let it cook longer, your batch may take longer than mine did (3) If there is a lot of water at the end, drain it off, then cook for a bit longer so it can thicken. You can add some more of the spices if you worry that you drained them out (4) Reduce the amount of water you start with. If it seems too dry, you can always add more throughout the cooking process (5) blend the finished product. Apples have a lot of water, just like Peanuts have a lot of oil. Sometimes apple butter will separate like a natural peanut butter, only with apple butter you get water instead of oil. Try blending it and it should reincorporate into the recipe. Can’t wait to try this. A tip for you to try. I love crockpot liners. I don’t cook without them since I discovered them. In a pinch you can use oven bags. They seem to be the same thing. Only difference I have found is that the oven bags will not fit in an oval crock pot, only the round ones. Clean up is so easy! Hi Darcy, Yes, please let me know if it works out for you. I plan on making some pear butter this year as well. What is the best kind of apples to use? Hi Terrie, I would use a neutral apple, like Fuji, Gala, or the Red Delicious. The spices and sugar will leave you with a saturated apple flavor, so I wouldn’t waste the extra money on specialty apples, like HoneyCrisp. I’m going to try this tonight! I bought macintosh apples because they were on sale…do you think they will work out ok? I was just reading some comments and I’m afraid I’ve bought the wrong kind! No worries, any apple will work just fine. You may just need to adjust the time of cooking at the end, but it should work out just fine. Good Luck! Hi, I was wondering if this can be canned? Hi Kayla! Yes, I know of many people who successfully can large quantities during the fall. How long & at what psi do you recommend for canning or is a water bath acceptable? thanks! I haven’t canned the apple butter myself, but I’m told a water bath is preferable in this case. if you dont have canning jars can you use plastic containers to store/freeze? Did you make a recipe yet for pumpkin butter? The pumpkin butter recipe still needs some tweaks so I plan to have it up this fall once sugar pumpkins come out again. Thanks! Mmmm, can’t wait for the fall! Do you think this can be processed in a water bath canner for long term storage? This sounds similar to traditional ‘Jersey Black Butter’ which has a brilliant flavor. I must try using the slow cooker to make it, but can’t believe it would taste anywhere near as good as cooking it for 24 hours over an open fire, singing and drinking copious amounts of cider with friends and family. Agreed. The crock pot has nothing on cooking over an open fire. Yum! Everything is in the crockpot now; I can’t wait!! Does it really only make one pint. That doesn’t seem right. The exact amount you end up with can definitely vary. I used a small size apple and they cook down A LOT so I only got about a pint out of the batch. If you are using larger apples from the grocery store, you’ll likely end up with more finished apple butter. This recipe is wonderful; it finally finished up around 1am after cooking all day. Let me say it was totally worth the wait – the taste is out of this world and the whole house smells of spiced apples. 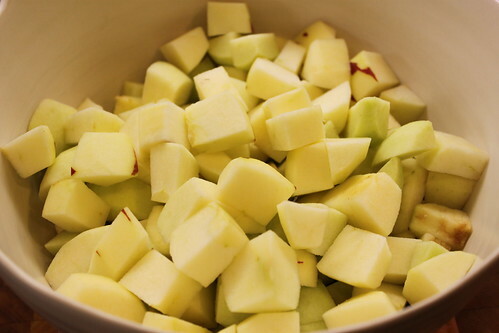 I used around 9 Gala apples from my grocery store and they filled my large sized crockpot. I added a bit more brown sugar (cuz I have a crazy sweet tooth) and it was so not needed in the end. Also, I didn’t have all-spice so I broke it down and used cloves and nutmeg separately as a substitute and that worked just as well. I propped the top to burn off the excess liquid, which the Gala apples made a lot of, around the 12th hour. At the 15th hour, I took a spoon and scooped out the remaining liquid to speed things along. I cooked it an hour more and then used a mash potatoe masher (?) to mash things up. My batch doesn’t have the smooth consistency that is pictured with the recipe and it is much darker, but I will definitely be making this again. Yay! Thanks for sharing how it turned out 🙂 Great tip on scooping out the excess liquid, I had that same problem with my batch. why not just not put so much water in it?? Mines in the crock pot right now but it is pretty liquidy as well. Thanks! I just got about 4 grocery sacks full of apples that look just like the ones you have pictures (no idea the variety, but they’re more tart and was told they’re a “baking apple”) and i’ll be making this tomorrow! Did u have to add anything to the canned ones to keep from going bad? I didn’t ‘can’ the apple butter. Since I only made a pint we just used mason jars to store it while we ate through the batch. However, from others I’ve talked to, you don’t need to add anything because of the high acid already present in the apples. I’ve also been told that water bath canning is preferable to pressure canning for apple butter. I’m not a canning expert, but I hope this helps. I have never canned but would love to learn and start. What is a water bath? Oh apples and fall!! I ❤ Fall! I'm going to replace the 1/4 cup brown sugar with maple sugar or date sugar to make it even better! I bet you could also use the equivalent of grade b maple syrup and get some more minerals in that way. I don't like processed cane sugar and that's why I use alternate sugars. My grown adult son happened to mention that he loves apple butter, so that’s what he’s getting this year as a Christmas gift. Thanks for the easy recipe! Ok this is on my bucket list to make, but where did you get those gorgeous bowl, I love them ?? The cream colored pouring/mixing bowls and serving dish came from Coldwater Creek. I don’t think this exact style is still being sold since I bought them on clearance about a year ago, but they may come out with something similar around the holidays. 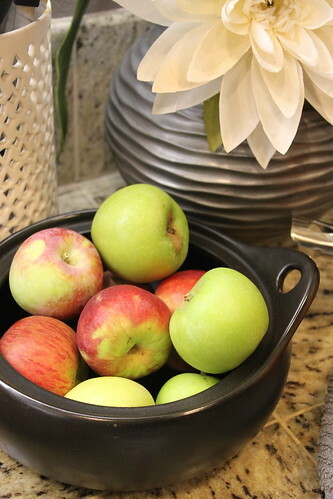 The black pot holding the apples in one of the pictures is from Cost Plus (World Market). Never had it before looks delicious! Could it be a substitute for peanut butter? Sure, you could use it in place of peanut butter, jams/preserves, butter, etc. I’ve even added it to smoothies as a flavorful replacement for other sweeteners. Would you recommend letting it cook for 15 hours, or letting it cook longer? The time is not set in stone, it may take longer. If you find that there is too much liquid, then remove some and let it cook another hour. The excess water is the primary reason for the long cooking time. I just made mine and it also was a dark color, but very good! I used 12 Braeburn apples and it was perfect. 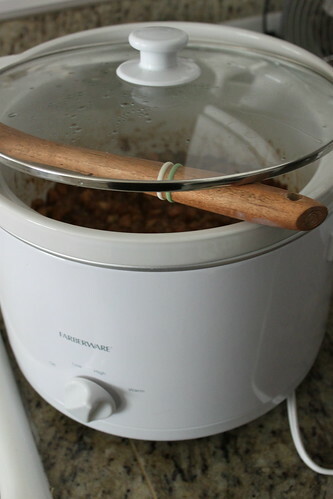 I doubled the water, sugar, and spices as the apples filled the crockpot. I had mine on low for about 24 hours, and used an immersion blender after it was done. I didn’t peel the apples, and that might be how I have about 2 quarts. It is just as smooth and very yummy! Thanks for the recipe – found it on Pinterest! Id love the pumpkin butter recipe also please. Here I go with this one! Yes, canning is a excellent option! In fact I would recommend canning before freezing. The only reason I froze the rest was because I had such a small amount. Good Luck! Eager to try and looking forward to hearing about the pumpkin butter!! Ive never frozen apple butter how did that work out? It was great! I set it in the fridge to defrost and there was no change in the texture or taste. Been going since 9 am, so excited, can’t wait for the finished product!!!! I will going to a farmer’s market Sat. and now know to buy apples so I can try this. A yummy Pennslyvania Dutch treat is apple butter and cottage cheese. Thanks for the recipe! Found this recipe on Pinterest and finally got around to making some of your yummy apple butter last night/this morning…AMAZING!! We have an apple tree in our backyard and I’m heading to the store to buy some more jars…I’m thinking Christmas presents!! Thanks for posting this and for so clearly explaining all the details! So excited that I found this! Was planning a trip to Raven Hills Orchard this weekend and looking up some recipes for the apples that will be coming home with me. Does anyone know the shelf life of this apple butter that has been canned via the water bath method? Can this recipe be processed and canned with a hot water bath as if making jam? My grandma just gave me sooooo much fruit. I was looking for a recipe for apples (that was applesauce… I’m super sick of applesauce. I’m really excited to try this! And I bet it makes the house smell wonderful. I made this today, and I LOVE it! Thanks so much for sharing. Would love to hear feedback from those who have made this and canned it? How did you do it? How did it taste? Was hoping to give for gifts at Christmas. Do you use light or dark brown sugar? 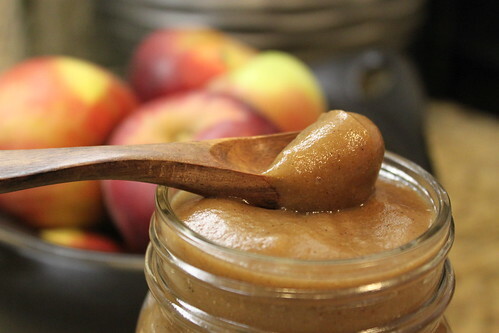 I love apple butter and just may have to try this. Thank you. I used light brown sugar for this recipe. I just made this with my mom and it is amazing! We buy this from an Amish family every year and it has gotten extremely expensive to buy. We are so happy to be able to create our own now for half the price! Thank you!!! So Trying this! Thank you! Has anyone ever substituted apple cider for the water? Wonder if it would work and add to the flavor, but don’t want to waste all the apples if I should stick with water? I know people have been very successful using cider instead of water. I plan on trying it myself soon, so I’ll let you know how it works out for me as well. ralphs grocery markets has the sweet punkins i seen them there wensday its time to make it we are waiting. This sounds delicious! Thanks for sharing the recipe, can’t wait to try it out. Just finished making this and it’s delicious! I had enough for two jars with just a tad left over. I didn’t want to waste that little bit so I poured it, still warm, over vanilla ice cream and added walnuts! Holy moly, was it good!! Hi Addison, I am just wondering what size crock pot you used? I would like to add more apples to get a better yield but don’t know if they will fit into my 5 quart oval crock pot. I used a food processor but I imagine using a hand mixer would help a bit, too, or just a regular blender. Hi ! My name is Kenda. I am trying this out as we speak ! (For the first time) Lol and have a question. Was hoping you could help me out. I made a double batch of this recipe and its been in the crock pot for right at 24 hrs. I see in your pictures that yours seemed to have gotten kind of thick and so far mine still has a lot of liquid in it. Is this normal and will it thicking with more time ? Or is that how it supposed to be ? I seen that yours took awhile and since I doubled the recipe I figured mine would take longer. But like i said its been right at 24 hours. So im just wondering. It smells wonderful and I just don’t want to over cook it. Try taking some of the extra liquid out (a turkey baster works great for this), and cooking it with the lid off or propped open. That should help thicken it up a bit more. Ok ill try it ! Thanks for the quick reply. My apple butter finally finished. Took about 29 hours. Ive never had it before so I wasn’t sure what it was supposed to taste like. So I had my husband try it (since hes the reason I made it) and he said it was good but had a strong taste of the allspice flavor. So Im thinking next time I will still make a double batch but only use just the 1/2 tea. of allspice. And also mine too only made a little more over a pint total. Even with 24 apples. Although they were the smaller apples. My husband use to eat the Bama brand apple butter so thats the taste he is use to. They no longer make it for some reason. Anyway he did like it just wasnt Bama ! Lol Again thanks for sharing this and for the help yesterday. Thanks for the tip Rachel. I will be trying this again and will defiantly keep this in mind. Trying this now!! It sounds so yummy!!! 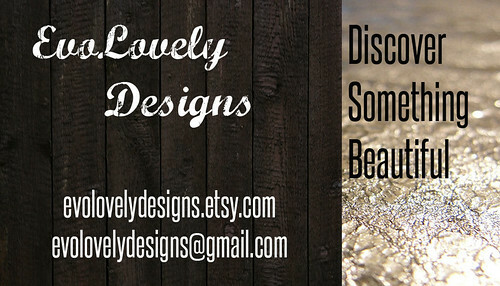 Check out my blog I am starting! I have made this recipe twice now. It turned out perfectly. We have our own apple trees and I used a combination of Macs, Spys and Red Delicious. I also used dark brown sugar. We are enjoying it so much and would really like the Pumpkin Butter recipe you said you were going to post. Tried this recipe and the only thing I changed was adding 1 teaspoon of allspice and 1 1/2 teaspoons of cinnamon and added 2 cups of regular sugar as it was not sweet enough for me because my apples were more on the tart side. When it was done, it was absolutely perfect! It made 3 1/2 jars for me (random sized jars). soooo good! Those who have canned this successfully, how long did you process it for in the hot water bath? I’m thinking of making some of this for my boy’s teachers for gifts. Wow!!! Well worth the wait! I only had the red store bought apples & they (while time consuming) worked just fine 🙂 I’m sure had I used fresh picked the flavor would have been tastier but I myself am completely satisfied! I did use a little more brown sugar than called for & the apples took a little over 24hrs to break down but all in all this is a winner in my book !! Loved this! So easy and tastes great. Oh, and it makes my whole house smell amazing. Found this on Pinterest… making this now!!! can’t wait!!! I found this on Pinterest, and started it yesterday afternoon. I woke up to an AMAZING smelling house 🙂 all my neighbors are asking me to share! It’s delicious! FINALLY going to make this! Starting it tonight in hopes if getting it cooked down, blended, and processed in water canner by Sat night/Sun morning. 🙂 Really looking forward to my house smelling delish in the process! Ok, it’s in. May have messed up the recipe a bit. Didn’t have all spice so I used pumpkin spice instead. Plus the amount of brown sugar didn’t look like much so I added a little more. Hopefully it’s ok because I used nearly 7 lbs of apples.. Stay tuned. Heidi, did it can well for you? I’ve been thinking about doing this for some Christmas gifts….. Yes, it came out great! I too am making them for Christmas gifts. I used GALA apples this batch but will try another type next batch. How did you can them? Did you just put them in jars, seal them and you’re done? Thank you so much for this wonderful tutorial and pictures. I made this butter this week-end and it is amazing! I made two batches of this since I had 25 apples. I made it with a combination of granny smith and braeburn apples. The Braeburn apples are sweet so I didn’t have to put in so much sugar, but I diid put in 1/4 cup. 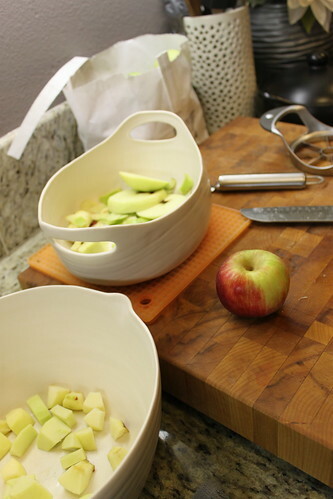 I also had an apple peeler/corer/slicer which made this soooo easy! Thank you for the recipe! Can’t wait to try it in the crockpot. Nothing better than the smell of apple and cinnamon in the home! 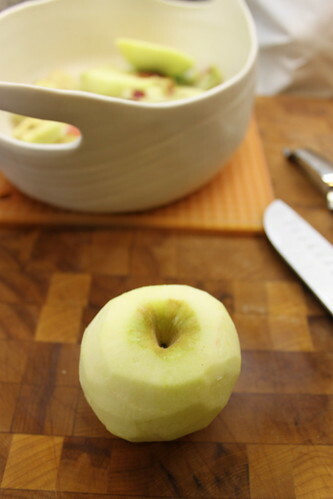 For those who wonder the type of apple to use try this link I found it very helpful in preparing my fall apple desserts. I have found that firm tart apples are best for butter. Red Delicious apples, in my opinion, are too sweet and the spices overwhelm the apple-y flavor we all desire. But that’s just my opinion. The great thing about this recipe is personal taste. My mom used to throw in a handful of cinnamon candies like “red hots”. Ok so I accidently cooked mine on low for like 20 hours haha do you think its still ok to eat?? It looks amazing!!! (and i’m sure it tastes amazing too!). I will definitely try this , but i would like to know, how long can i keep it in the fridge? It lasts about a month in the fridge if the container is kept tightly closed. I cooked it on high for about 3 hours. I made this yesterday and it came out delicious. However mine came out about 10 shades darker than yours….looks absolutely nothing like your end result picture. Still tastes amazing. I too got mine from an apple orchard, and I cooked mine until they were no longer runny/watery, and when it was done I put them in a blender, while still very hot, and blended until it was smooth. The air did not make it any lighter, like some have suggested here. Just confused. I’m glad it tastes great though. It lasts about a month if tightly closed and stored in the fridge. If you want it to last longer, then I would suggest putting it through the water bath canning process. Thanks! This looks very good and I will be making a batch this weekend. Pingback: This Week’s Meal Plan & A Few Of My Favorite Things « hey, beth baker! I started this last night after i got back from the market, and this morning my house smells like an apple dreamland! Thanks for the great recipe! Just a tip for those who may be using Red Delicious apples: after 17 hours of cooking, my “butter” still has a ridiculous amount of liquid in it. I would recommend starting with less water and adding more if needed. I’m going to let it cook down on high for a few more hours, and then I’ll drain off some of the liquid if I still need to. So excited to try this recipe. Couple questions tho, ok I’m understanding that this “canning” hot water bath deal-ly will preserve the apple butter longer, but do you need to fridge it after if you go that route? And how many jars can you fill from making this recipe. Thanks! btw LOVE your cutting board. If you ‘can’ the recipe via a water bath, then you don’t need to keep it in the fridge. You’d keep it in the pantry until you open the jar. Once open, it should be stored in the fridge. Each recipe will vary a bit (as your apples may be larger or smaller than mine, etc). I made a little over a pint of apple butter out of this recipe. I think I got that cutting board at HomeGoods for $49. Best investment in my kitchen so far, I use it for everything, and I like that it looks great left out on the counter. I am looking forward to trying this. It looks great! One question…How long does it last in the fridge? It should last about 3 weeks in the fridge if kept in a tightly closed container. I’ve got this in the crock pot as I type and it smells HEAVENLY! Question though: how much liquid do you leave in it, if any? I’m not sure how much I need to cook this down to get a good consistency when I purée it. Any advice? I made this earlier this week, and OMG, it’s AMAZING! My whole house smelled fantastic all day. I followed someone else’s tip and didn’t peel the apples, and it still yielded great results! Thank you so much for the recipe – I will be making again and again! I can’t wait to have some on my toast or pancakes. Or in my oatmeal! I bet it would be amazing mixed into oatmeal. Merry Christmas! how long does it last in the refrigerator and how much does it make? Just finished this! Awesome!! I don’t even like apple butter! (I did taste it though! The flavor is AWESOME!! I just don’t like the texture for some reason.. I’m weird like that.) It’s a comfort gift for my daughter’s Grandma… She loves apple butter. 🙂 I had lots of fun making it! Totally making it again! Pingback: Bake up an Exciting Holiday with these Recipe Ideas! Made this last night and subbed the allspice with nutmeg since we didn’t have any in the house. SOOOO good! Is this what you mean with the CrockPot ? My husband is deployed and I was wondering if I could send this in a care package or if it has to be refridgerated the whole time? If you ‘can’ the apple butter it does not need to be refrigerated. My apple butter was not thick – but not runny. Does this mean I did not cook out enough moisture? Should my apple butter be thick? In other apple butter recipes I’ve seen, they say 1 cup sugar AND 1 cup brown sugar. Why do you only say 1/4 cup brown sugar? Just made this and it tastes amazing. Super easy. If you don’t put it in a blender you have great applesauce. Can you do this with pears? And how many pears would you use? Annika, That sounds really good. If I were doing it with pears, I probably would not add any water because pears are pretty juicy already. I made this because my husband is a huge fan of apple butter. He absolutely LOVED it! Thank you so much for the recipe. We are going to be making this as Christmas gifts for friends and family! Do you leave it cool in mason jar before putting lid on or what? Help don’t know what to do!!!! Silly question but what kind of apple do you prefer using? People tell me to use a cooking apple, but what is that? So excited I am making this today! I would love to jar it, do you know how/what I need to do that? Also how did you freeze some, in a plastic container? Hi All! I am making this amazing dish as we speak and started the crock pot at 9:30 this morning. It is now 1:30pm and I realized the crockpot was on high, instead of low. I just changed it to low – but am I screwed now?? or will all be okay??? No worries; apples have a lit of water to cook out. You’re fine. It just means that your total cook time may be less. Grr… the first time I made this recipe it turned out absolutely amazing the second and third time I’ve done it they’ve both been a little bit bitter and the colors been lighter I can’t think of what I did different from the first time except the only thing I can think of is with the first batch I cooked it all day and all night and even half a day the next day the others I got a little inpatient and cooked them for the 15 hours. Going to try this again and cook it a lot longer. I was just going to say the color would be because you didn’t cook it as long. You had more of an applesauce instead of apple butter. 🙂 Just cook it a little longer. Also the bitterness may be from the type of apple you used. This looks amazing! How long is this good for in the fridge!!? hey there! 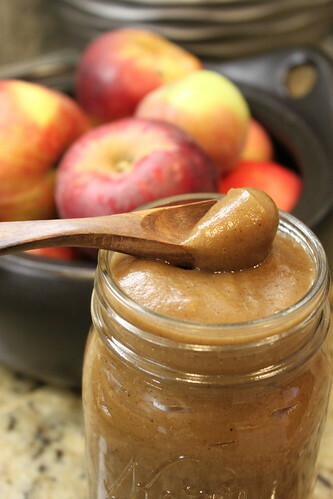 Love your apple butter recipe and would love to make a bunch of mini Mason jars of this for stocking stuffers! How long does it last in the fridge do you figure? Also, I’m an amateur with canning here – do I have to do the whole canning process? What is that process? or can I just spoon into small pre cleaned Mason jars and seal the lid? Thank you for the inspiration! We have been enjoying this apple butter for the last few days. 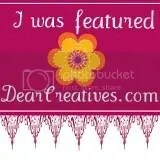 In fact, I shared it with my blog readers! It’s a delicious taste of autumn and couldn’t be easier. Thanks again! am going to a apple farm soon. what apples work best? in the past i have used granny green apples and a sweet type apple mixed together. I am thinking these might be good canned for gifts. What do you think. thanks for sharing recipe. 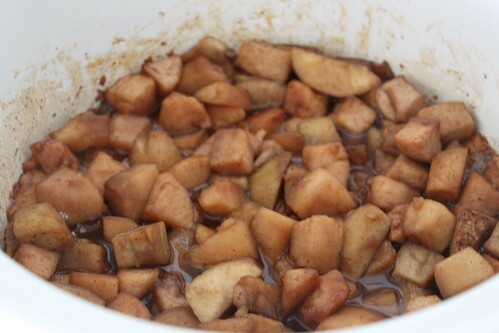 So, funny story… My sister sent me this recipe over a text and I was in a bit of a rush to get it started before I left for work and misread 3lbs of apples for 3 apples… Do you think I can save this batch by using a food processor and adding the additional apples when I get home from work later? Or should I just cut my loses, start over, and do it right the 1st time? This looks amazing! I love that it’s smooth. I’ll definitely be giving this a try. My batch is cooking in the crock pot now and it smells so good!!! Are there any special instructions to canning once it’s completed? Or do you just put it in a sealed mason jar? Thanks!